In the first 6 months of this year LEGO’s revenue and profit surpassed Mattel’s (Barbie) making it the world’s biggest toy company. In a world increasingly enchanted by tablets, video games and electronic entertainment LEGO is managing to keep children interested in its bricks. LEGO is successfully integrating the physical with the electronic by entering into super hero franchise deals, video games and with its own LEGO movie. It might be surprising then how disappointed i am with its product lineup. This coming Christmas I’ve decided to make a single, joint present to my sister’s daughters (S6.7 and E3.6). A shared gift which they would build and own together for all the benefits that it could (hopefully) lead to. Naturally the first idea that came to mind is LEGO. On it’s website LEGO has 30 possible product ranges to choose from. These include video games and a couple of other non-physical products. The rest consist of the standard bricks. A lot of them are Super Heroes, Lord of the Rings and other franshises. These are targeted to boys for the most part with the occasional female character. Out of all these products i soon realised that my options were quite narrow for the girls. I basically have 3 options. The Disney range, which includes princesses and castles, all in pink. The girls (which is something i noticed happening around me in general) are already being bombarded enough as it is with this theme and i don’t want to add to it. A boy is encouraged to dream of being an astronaut while a girl is supposed to dream of being a princess or just marrying a prince? This seems to be the bottom line here. Then there is second possibility with Friends. This one is not pink. It’s an all purple range….. It seems girls are being trained from an early age to focus on pink and purple. As if these are the colours they are meant to choose. Anyway, this is not just a LEGO problem. There is a wider variety in the Friends range with sets such as the Summer Caravan, Mountain Hut, Shopping Mall, Lemonade Stand, Beach House, Juice Bar, Sports Car. Once again though, i don’t find the themes here appealing. There are slightly better options which are more promising such as the Jungle Rescue Base, Jungle Tree Sanctuary, First Aid Rescue, Lifeguard post. They actually involve something which is not stereo typically “girly”. However, it seems that all the jobs available for girls involve animals and are in the jungle for some reason. Also it’s a range that only includes girl characters. There does not seem to be a representation of the other gender in this Friends universe. I think the only boy is in the shopping mall set and in the video he is the only one depicted as working. He is either making pizzas or as a dj. The girls are there to shop. Then we go the final option which was actually my first option to consider. The City. The City range revolves around occupations that are mostly performed outdoors and/or might be considered exciting by children. Police and Fire Brigade stations. Garbage and Cargo trucks. Mining and Logging. This is basically the idea. I understand that in real life most of these physically demanding jobs are indeed taken by men. However, the female gender is basically non-existent in this LEGO City. There is the Town Square set with 8 figures with only one being female. Then there is the Arctic range, which is the one i have my eye on. In the base camp set, there are 7 figures with only 1 being a female character. There is a scientist and a research assistant and they are both male whereas at least one of them could easily have been represented by the other gender. I don’t understand this at all. It’s clear that LEGO are targeted, for one reason or another, mostly to boys. For any girls interested in LEGO they have their “own” distinct ranges. The pink and purple ones. With princesses and shopping malls. In principle, i don’t like the idea of toys for girls and toys for boys. With LEGO i also don’t agree with its representation of The City. There are plenty of opportunities to establish the presence of both genders but they simple don’t do that. Another example is with this Helicopter rescue base which has 4 figures. There’s 1 female who is the ambulance woman. The doctor is male when again the opportunity is there to have a more equal representation. 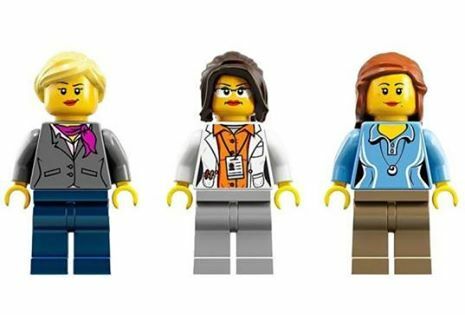 Even if these LEGO sets are targeted towards boys what’s so wrong about boys building and creating them with female scientists and doctors? Would that be so bad? I also don’t want the girls to see doctors, scientists and a City with only men. I don’t want them to see a LEGO world where they are only represented when it’s all about princesses and shopping malls with everything and everyone dressed up in pink or purple. I still intend to get them a LEGO set because i still see the benefits of a child playing with LEGO. In fact, i’m planning to buy the Arctic Base camp. However, i’m also getting a few extra LEGO figures so that both genders can have an equal representation. Maybe the girls will dream of being scientists working in the Arctic after Christmas. Maybe they won’t. At least they’ll know that they can.